Propped against the wall in the office of MiaSolé's CFO Merle McClendon sits a solar panel made by the wildly successful First Solar, which makes cadmium telluride solar cells. After he became MiaSolé's CEO, Joseph Laia asked customers what they didn't like about it. It was too small, some said, and required too much cable and hardware to install. Installation costs were higher than expected. Some also said First Solar's panels operated at too high a voltage. That feedback was folded into the design of the MiaSolé CIGS panels: they are larger (about a square meter), operate at a lower voltage and their junction boxes require less cabling because they are located on the corners of the panel. MiaSolé's panels also weigh about half as much for easier installation, and future ones will weigh even less because MiaSolé will sputter its solar cells onto metal instead of glass. Laia's comments, though, don't come across as executive trash talk. The more he speaks, the more you get the idea that Laia likes First Solar and even admires what the company has accomplished. He just wants to beat them, too. This fall, the world will get an idea if MiaSolé can do it. The copper indium gallium selenide (CIGS) solar panel maker has reversed some of the manufacturing and production delays that hobbled it from 2006 through 2008. MiaSolé will ship 6.5 megawatts in the first half of this year and expects to ship 22 megawatts in 2010 in the form of 111-watt modules with an average efficiency of 10.5 percent. In a bit of a breakthrough, MiaSolé just announced that NREL confirmed the 13.8% efficiency of its large area production modules. First Solar, by contrast, has hovered between 10 and 11 percent efficiencies for years -- conversion efficiency was 11.1 percent in the first quarter of 2010. Still, one can't confront First Solar without confronting costs. First Solar has the lowest costs per watt in the industry with a module manufacturing cost of $0.81 per watt. Laia spoke of Chinese vendors having the potential to sell their panels at $1 per watt in the near future. Addressing solar vendors at large, Laia said, "If you don't see your way to having your cost under 85 cents per watt -- I wonder why you're not looking for a new job." He then revealed that MiaSolé's capex was 50 cents per watt and emphasized that that was "today," "real," and "all-in." The company declined to quote their exact price per watt. "For us, the goal is to drive polysilicon performance at thin film cost," said the CEO. Photovoltaics based on the CIGS material system have been hailed for their potential for a decade, but it's only recently that volume commercialization has begun. In 2009, about 43 megawatts of CIGS PV shipped, mostly from Showa Shell (now Solar Frontier), Global Solar and Honda, according to GTM analyst Shyam Mehta. That number should rise significantly in 2010, with CIGS shipments from MiaSolé adding to the total. Laia gave us a glimpse of some future products in the pipeline, which include flexible solar panels a la ECD and solar shingles. MiaSolé has its share of challenges. CIGS remains an ornery materials system, and the recipe and process has to be stable as the firm expands into new facilities. Expanding into new facilities takes cash, lots of it, and that means raising considerably more funds, whether from existing investors, new investors or the government -- state, federal or perhaps another country. MiaSolé has raised at least $300 million in venture capital since its inception in 2001. They are in the midst of raising more money now, according to VC and banker sources. And as Laia himself said -- if you can't get the price down to below 85 cents per watt, the CEO may have to look for a new job. Stion just unstealthed as a CIGS startup -- with a bit of a twist. Solyndra continues to win large rooftop installations such as Anheuser-Busch, Coca Cola and Frito Lay. Inside sources say that the firm is sold out for years to come. Nanosolar's most recent announcement was the replacement of its CEO and a visit from Arnold Schwarzenegger. SoloPower raised some money, partly to pay off their irate CEO and CTO founders in an edgy VC investor-founder tussle. Global Solar Energy has 75 megawatts of production capacity at two sites and has recently completed a large rooftop CIGS installation. Solar Frontier (the former Showa Shell Solar) sold approximately 43 megawatts of CIGS PV in 2009 and could ship more than 100 megawatts this year according to Shyam Mehta, one of our esteemed solar analysts at GTM. AQT won $10M in funding recently and entered an agreement with Intevac. Dow invested in Dave Pearce's NuvoSun. Daystar got its fifth CEO in twelve months. 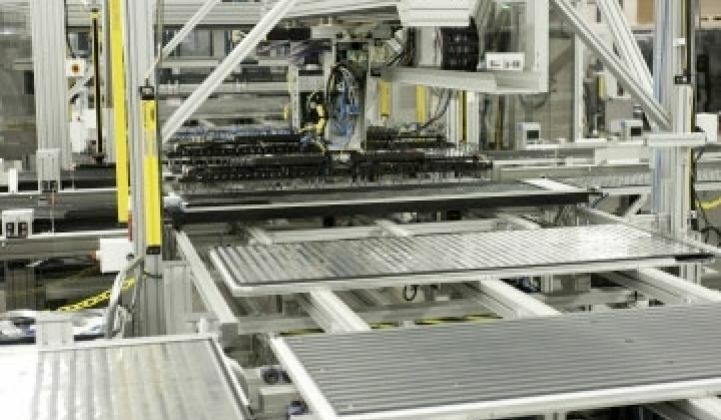 Ascent Solar began production at its FAB 2 production plant (video here). Q-Cell's Solibro CIGS facility claims the highest CIGS production capacity worldwide, according to their website. HelioVolt announced, well, nothing. Their last press release was in June 2009. Some bad news here. Johanna Solar supplied panels for a Bosch building façade. Bosch is an investor in Johanna. Saint-Gobain subsidiary, Avancis set a 15.1 percent small aperture efficiency record early this year and just announced a new factory build. Illies Renewable will be starting up their CIGS turnkey line from centrotherm, targeting annual production of 36 megawatts. Nexcis has an electrodeposition-based CIS cell process in France.